Ever since building our very first pergola for the farm a few years back – our pergola building process has turned in to a part time “hobby” – making quite a few more for friends, families and others. 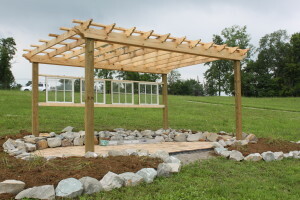 ( See : Building Our Farm One Pergola At A Time). So for those that are considering building one of their own – we thought we would share some of our tips and hints that we have learned when it comes to creating a beautiful and durable outdoor garden pergola. 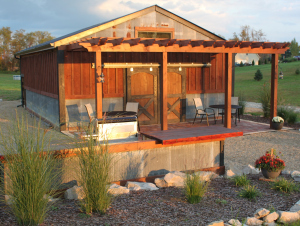 Our hillside vineyard pergola we built last year – complete with reclaimed windows. With any outdoor structure, everything starts with the base. To put it simply, don’t skimp on your posts. When working with wood, a 4 x 6″ or 6 x 6″ post is your best choice for long-term durability. 4 x 4″ posts – although much less expensive than the thicker ones, simply won’t hold up over time. 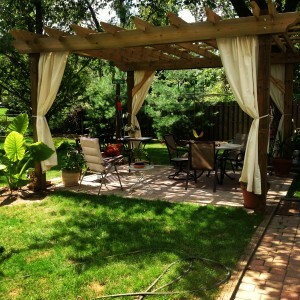 They will begin to bend and bow – and within a year or two – your structure can start to look more like a curvy art sculpture than an outdoor oasis. Another one of our favorites – love the way they decorated to make it their own! There are a lot of choices when it comes to what species and thickness of wood to use. It really comes down to personal preference. We build all of our beams and top purlin boards from 2″ thick lumber. Although there are thinner and less costly options – the 2″ thickness gives the piece long-term strength and durability. 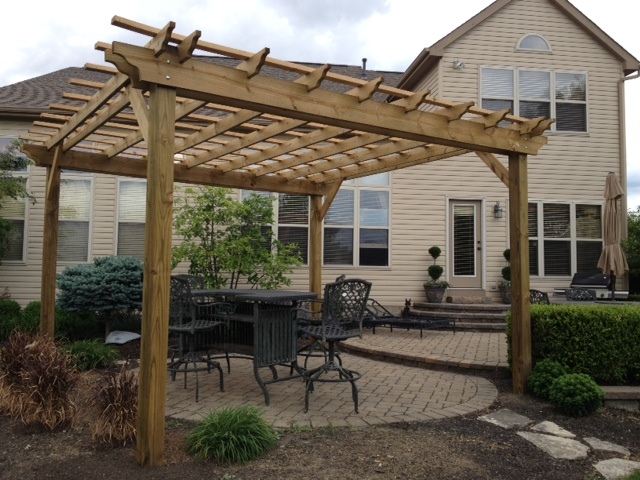 Almost all of our pergolas are made from treated lumber. It’s a great choice when looking to handle harsh outdoor conditions. It’s also very versatile – you can leave it to weather to a natural grey patina – or paint or stain it to match almost any wood species or decor. Cedar is another viable option, but the cost of cedar is becoming astronomical, and it is very hard to find in 2″ thickness. No matter the wood species, thinner boards tend to end up like the thinner posts, bowed and curvy over time. A lot of people ask us if its better to bury the posts, or to mount them on a concrete pad or footer. It really comes down to personal preference, as both work well. 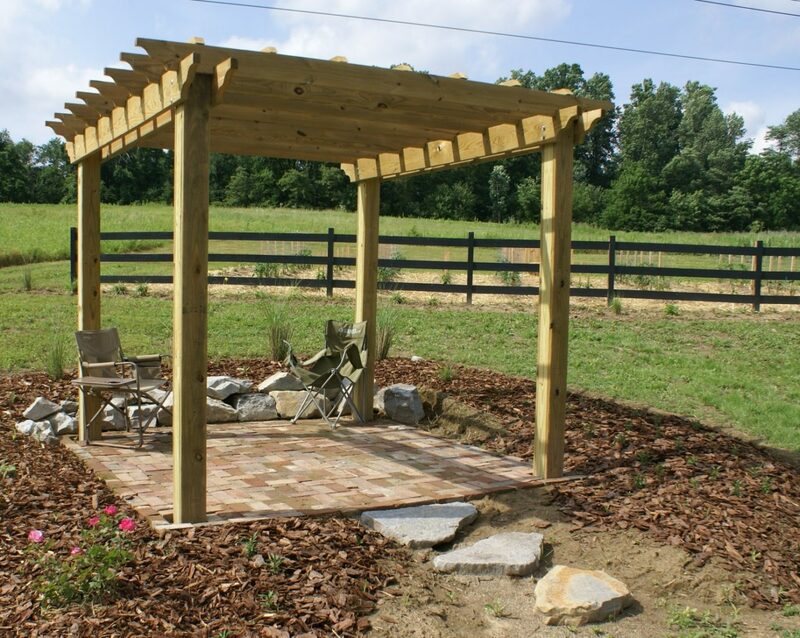 Our recycled barn as it looks today with an added pergola. If you have an existing concrete patio – then by all means securing your posts with a bracket is the way to go. You can find simple plate anchors (Simpson ties, etc.) at most home improvement and hardware stores that do an excellent job of securing posts to concrete. If you choose to bury your posts – make sure to dig down deep enough to get below the frost line and prevent it from heaving out of the soil. For ours on the farm we buried our posts 24″ and then back-filled with packing limestone gravel and dirt. Quite simply, the important thing is to definitely secure it! If it’s not secured, all it can take is one little serious windstorm to turn your beautiful little paradise into a pile of toothpicks. ← Strawberry Salsa Recipe – Refreshing Sweet Heat Taste To Spice Up Spring!